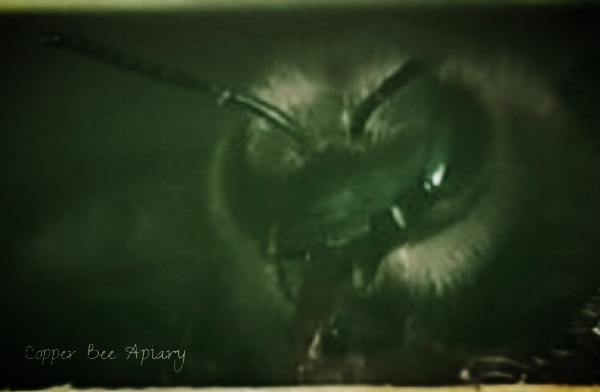 ...from the monsters of Copper Bee Apiary. Bee sticking her tongue out. In which the private life - or rather death - of a drone is unceremoniously examined under the glare of a microscope. Thank you very much for the Christmas microscope. It is exactly what I wanted. The basic functions are easy to use so I was able to start playing with it straight away. It also does quite a lot more advanced things that I have yet to study so there is definitely "scope" for further investigations. You can look directly through the eyepieces and/or you can connect it to a computer to see the images on-screen and take photographs and videos. I had a look at some wax, honey and pollen scooped from a honeycomb. I then looked at a bee's wing, taken from a dead bee lying outside in the rain. The veining of the wing shows clearly. Surprisingly, the wing membrane seems to be hairy. Here are some photographs of it taken using the microscope camera, via the computer. I think some of the other marks are droplets of rain. Bees' feet are more complicated than our own. A lot of engineering goes into them, to allow the bees to walk on different surfaces. Most bees I know can walk up glass, whereas most people I know can't. Jonathan Pattrick is a local student doing his PhD thesis on how flower petals and bees' feet interact, and he gave an evening talk to the CBKA on this subject. See those tarsal claws, like grappling hooks at the tip of each leg? Those, Jonathan explained, are for walking on rough surfaces. Each foot has two claws, hooking outward. Between the claws is an adhesive pad. This secretes a liquid so that the foot can stick to a smooth surface by surface tension. The foot is unfoldable to expose the pad. So to walk on a rough surface, the bee uses its claws. To walk on a smooth surface, the bee unfolds its feet and uses the sticky pads, placing each pad down and then peeling it off in exactly the right way to detatch it. Jonathan showed video footage from a light microscope positioned under a slide, looking up as the bee walked over the slide. You could see the footpads spreading over the glass to stick down and then peeling off again. The pads are BIG. The whole foot unfolds. Apparently these unfoldable adhesive pads are found in ants and wasps as well as bees, but each species has its own version. And while honey bees have big sticky pads, those of bumble bees are much smaller. Which means, in practice, a honey bee can walk up a hollyhock flower (very smooth) whereas a bumble bee cannot - the bumble bee has to fly in for a direct landing on the anthers. Debate ensued as to how flowers might be manipulating insects by having rough or smooth petals to pick and choose their pollinators - is the hollyhock strategically directing bumble bees to touchdown right on the pollen-covered anthers? Do other flowers "deliberately" have rough surfaces so that their chosen pollinators can easily walk in? What does that mean for crop breeding programmes? Hopefully Jonathan will return to tell us more when he has completed his thesis. Meanwhile, I took this photograph of an ichneumon wasp on the window at home. Feet in action!